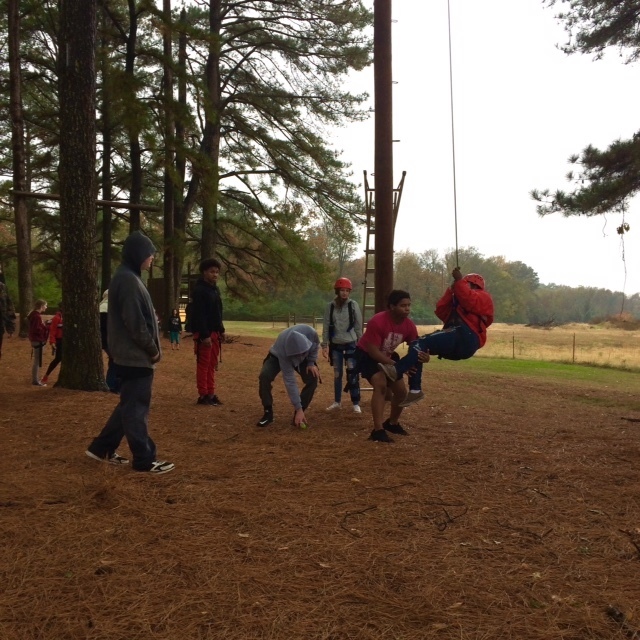 October 2016 – Jobs for America’s Graduates (JAG) students at the Russellville Secondary Learning Center participated in a full-day field trip to the Paris School Ropes Challenge Course in Paris, AR. The goal of the day was to challenge students to get “outside the box” and try both team and individual challenges climbing, balancing and working together to harness and climb. The day was made even more challenging by a pouring rainstorm, but students persevered. “I did things I didn’t think were possible,” said Addie Horn, senior student. Students supported each other and staff by holding ladders, helping with belaying and harnessing and giving moral support. “It was really fun to cheer each other on and see what everyone was willing to try,” said Kristina Reynolds, JAG participant. JAG, sponsored by the Secondary Learning Center, is a national school-to-work support program aimed at students at-risk of academic failure. The program uses regular classroom work to help students gain valuable skills which will prepare them for the workplace or post-graduation training and education. JAG is in its third year at Russellville Secondary Learning Center.